We should know the name of Britain’s third-in-line to the throne soon (in which case we’ll update this post). 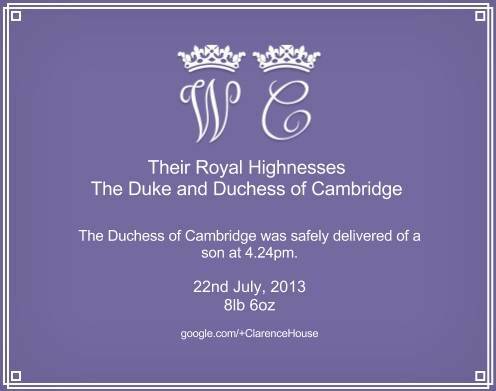 But until the name is announced, we’ll accept this rather royal-looking electronic baby birth announcement card available for the world at large to sign here on Google+. It looks and reads beautifully, with all the pertinent information–except, of course, the name! Isn’t the name really the reason people send baby birth announcement cards anyway? Maybe the name isn’t as important as simply getting the word out. Or bringing on the baby gifts. Whatever your reasons for sending baby birth announcement cards, we think there are a number of things worth noting about this card. Royal details, in particular. If you’re inclined to that type of thing. Or even if you’re just a lover of all things British. No name, yet still classy. Clearly there’s a history as well as probably good reason why the Royal Family has not yet shared the new royal baby’s name with the world. Privacy may only be one small factor. There are also centuries of ancestors to review, as well as consideration of the weighty opinions of the Queen herself. Talk about pressure! This baby announcement does a nice job of simply skipping over the name while still delivering the pertinent facts. Titles. Or a Fancy Monogram. Doctor? Lawyer? Clergy? Military? If you can’t properly play up a title, go for a large type for your full and proper names, or choose a design that allows you to customize with your own personal monogram. The most regal color when done in in the proper hue, purple reigns supreme. A royal blue or classic silver on white would also be classic royal color choices to try. Borders are more common to wedding invitations, so get creative and find a wedding invitation design that you can adapt for your perfect royal baby birth announcement card. There are many gorgeous designs to choose from at LookLoveSend.com. Browse either our regular collection of birth announcements or try for something even more regal among our wedding invitations to adapt for your birth announcement card. You can personalize any design with the proper wording for your baby’s announcement–name or not! Many of our designs accommodate a photo for a more personalized, photo baby birth announcement. 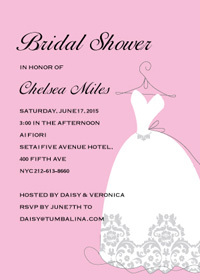 All cards and invitations print on premium, heavy weight card stock and approved orders ship within 48 hours!